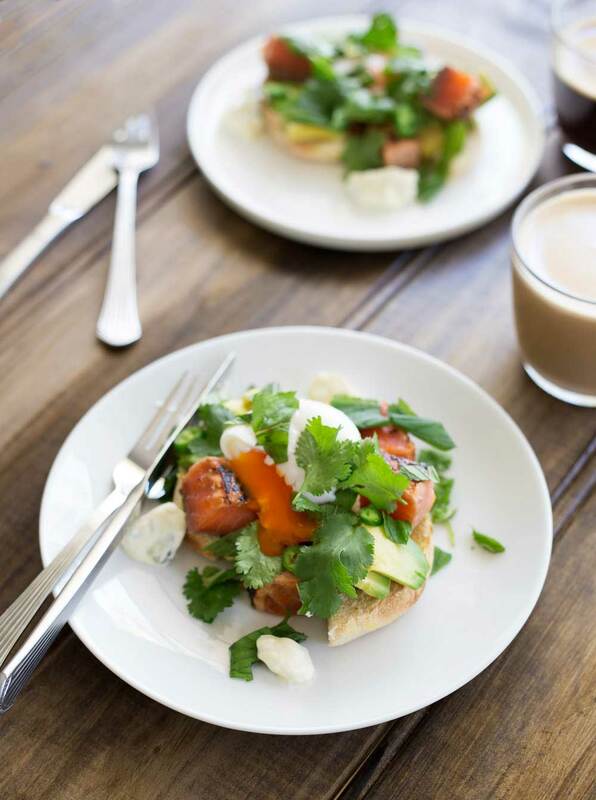 Salty, sweet cured salmon, a soft oozing poached egg, lime spiked avocado and the kick of chilli cooled with sour cream. All on top of a toasted English muffin. 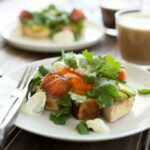 This muffin breakfast is miles away from the McMuffin and with a short cooking time this recipe is perfect for brunch. I can take or leave breakfast, it is too early in the day for anything big to eat and buttered toast whilst totally comforting isn’t something you can get excited about. But brunch, I love brunch. It is a proper meal, you can have a sweet brunch, a savoury brunch and if you are going out for brunch it is perfectly acceptable to order more than one course. 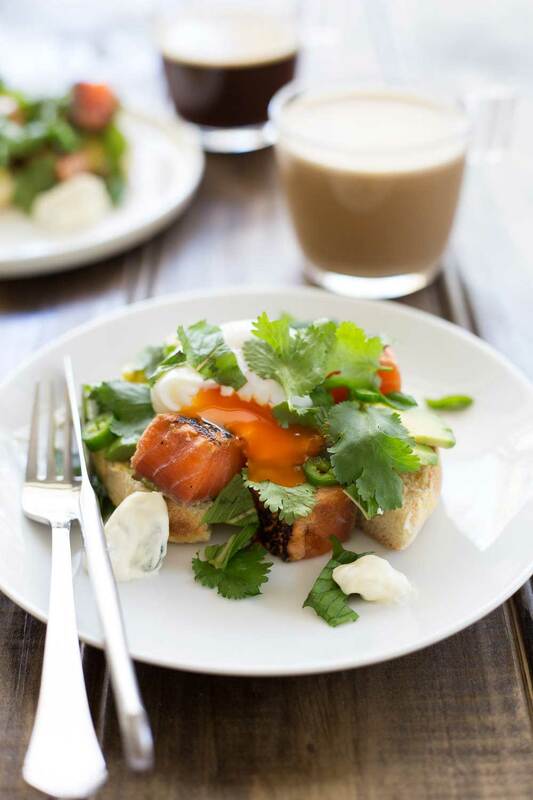 This salmon dish could be lunch and could be breakfast, so it is the definition of brunch! 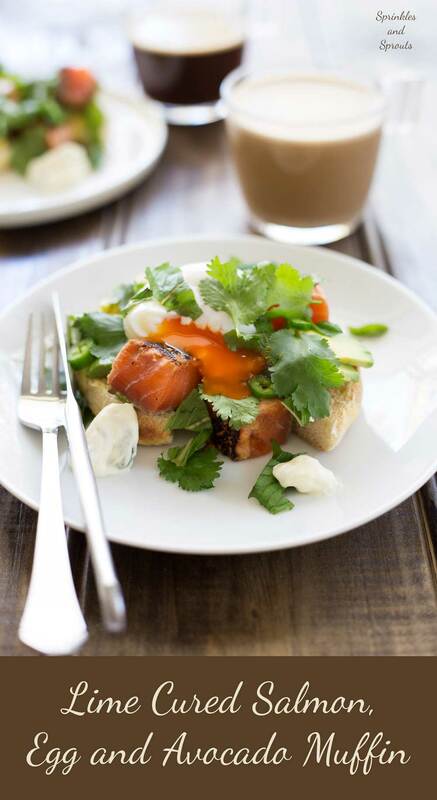 Home-cured salmon, a soft poached egg, lime spiked avocado, spicy sour cream and heaps of fresh herbs. Delicious! And far easier than it sounds! The salmon is cured in lime juice, salt and sugar. Then flash fried to give it some crisp and colour but not enough to cook it. You want the middle to be raw, so buy the best salmon. For 4 people you only need 300g. My boys love their salmon raw, which in my eyes is a wonderful thing and all thanks to eating sushi. Stew on the other hand hasn’t embraced barely cooked salmon, so I always cut a fillet in half and then cook his half for longer. 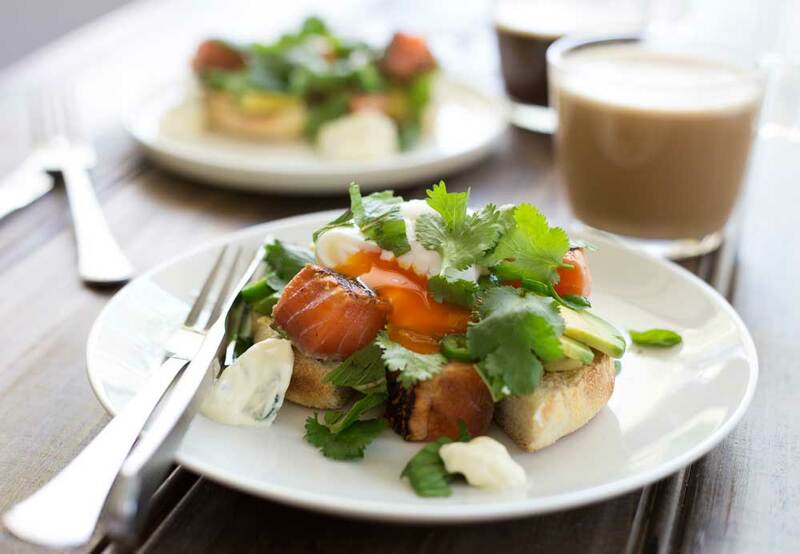 Coral salty, sweet salmon, a soft oozing poached egg, lime spiked avocado and the kick of chilli cooled with sour cream. All on top of a toasted english muffin. This muffin breakfast is miles away from the McMuffin. With a short cooking time this recipe is perfect for brunch. Zest one lime into a ziplock bag and then squeeze over the juice. Cut the remaining lime in half juice one half into the bag and set the other half aside for later. . Tip in the salt and sugar, seal the bag and then squish everything about to combine. Add the salmon fillets and place in the fridge to cure for an hour. Finely chop the red chilli and mix it with the sour cream, along with a pinch of salt. Place a heavy bottomed frying pan over a high heat and get it smoking hot. Remove the salmon from the pan and allow to cool whilst you prepare the dish. Bring a large pan of water to the boil. Place the eggs (still in their shells) into the water for 20 seconds. Then remove from the water. Turn the water down to the merest simmer and then crack in the eggs. Poach for 3 1/2minutes for small/medium eggs and 4 minutes for large/extra large eggs. Remove the eggs from the water and drain on kitchen towel. Cut the avocados in half, remove the stone, carefully peel, then cut into thin slices and spritz them with the reserved half of lime. Slick the muffin in half and arrange on a place with the pieces of avocado. Cut the salmon into small chunks and divide amongst the plates. Top with the poached eggs and then add plenty of fresh coriander and mint. Sprinkle over a few extra slices of chilli and spoon over some of the sour cream. I made the lime cured salmon in this recipe and made up some sushi bowls with rice and avocado for dinner – soooo good! I have never been great at cooking fish, and since we all love salmon sashimi, this method of preparing salmon was a big hit in our house. My husband said I’m not allowed to cook fish any other way again haha. The salmon turned out fantastic, thanks for the recipe! Oh that sound delicious! Great idea. This salmon look like a fancy dish I had recently in Paris 🙂 such a gorgeous presentation and the flavors are amazing! It’s almost lunch time here and your pictures are making me so hungry! This looks so delicious, will definitely give this a try over the weekend!